Birth of Joseph Darby registered March quarter 1897 at Dudley. 97 Regent Street, Woodsetton, Staffordshire. Mary Darby (45, Widow, born Coseley), and her 3 of her 4 surviving children of 5: William (24, Railway Porter, born Coseley), John (19, Moulder, born Coseley), and Joseph (16, Railway Telegraphs Dept, born Coseley). The 1st/6th South Staffords had transferred from Bethune to the Somme sector in mid-September 1918 in preparation for the assault on the Hindenburg Line. On 24th September, the 138th Brigade of the 46th (North Midland) Division had attacked the village of Pontreut and gained a footing. The enemy put down a retaliatory barrage on trenches held by the 1st/6th South Staffords (137 Brigade of 46th Division) which inflicted some casualties. It is likely that this was the cause of the wounds from which Joseph Darby died at 141st Field Ambulance on 25th September. Joseph was originally buried near Poeuilly, 5 miles west of Pontreut, but in August 1919 he was exhumed and re-buried in Roisel Communal Cemetery Extension. 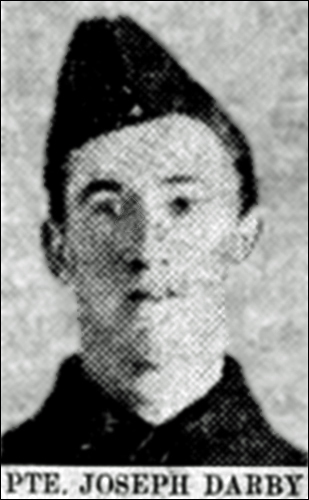 Private Joseph Darby, of 97, Regent Street, Woodsetton, is reported to have died from wounds in France. He was an old boy of Mount Pleasant Schools, Coseley, and was employed at Parkes’ Works, Woodsetton, when he joined up at the age of 18, being attached to the South Staffords.